During my first year of work, we used to send/receive many funny forwards to/from friends. In such a way, I received an email from one of my friends which had a collection of A-Z useful information about Cooking, Mehndi designs etc. I still couldn't recollect who sent that email. But a BIG thanks to whoever forwarded it to me. Now, that cooking manual is helping me to contribute a lot of recipes for my blog. Here I present one of the recipes from it. Pani Puri, is a well known North Indian food which is loved by all. It is known by many names across India. Whichever place it gets prepared, the puri is same but the pani (spicy tangy water) differs from place to place. 1) In a mixing bowl, add semolina and salt. 2) Add luke warm water and knead the semolina well. After a minute, add maida and continue kneading. 3) After kneading when the semolina - maida mixture becomes a smooth ball. At this stage add a teaspoon of oil to it and again knead it continuously for 15 minutes. Cover it using a damp cloth and keep it aside for 30 minutes (Idle Time). 4) After 30 minutes, divide them into generous size balls. 5) Take one ball and roll it using a rolling pin like chappathi. 6) Using a small sharp edge bottle lid or mini container, make round shapes (as shown in the below picture). Just remove those small round pieces with your hand. 7) Repeat this step for the remaning dough mixture. 8) Place the rolled out puri's on a damp cloth or food wrapper to avoid stickiness. (Initially I placed the puries in a plate and the puris got stuck to the plate. So I used my grandma's technique which I saw when she was preparing Thattai (South Indian snack). 9) Heat oil in a pan and when it is medium hot, add slowly few puries one by one. I fried three puries at a time. 10) Gently pressing the puries towards bottom of the pan makes the puries puffier. Turn to other side to fry. Make sure the flame is in medium hot, otherwise the outer part turns brown very quickly and inside it would be saggy. 11) Fry till the both the sides of puries turn golden brown in colour and repeat the steps for remaining no. of puries. 12) Transfer the puries to bowl wrapped with a tissue/ paper towel so that it absorbs the excess oil. Do not cover this bowl. 13) When puries cool down to room temperature, store them in an air tight container. 1) Grind mint, coriander and green chilli to a paste. 2) Add five cups of water to this paste. 3) Add tamarind chutney, Ginger powder, black salt, salt (white), chaat masala, cumin powder, amchur powder and stir well. 4) If you are using tamarind, soak it in a cup of water and extract juice from it. Add this tamarind juice to the water. In this case add four cups of water and a cup of tamarind juice. Adjust the spice and sourness as it suits you. 1) Pressure cook the potatoes and mash them well. Make sure the potatoes are dry. 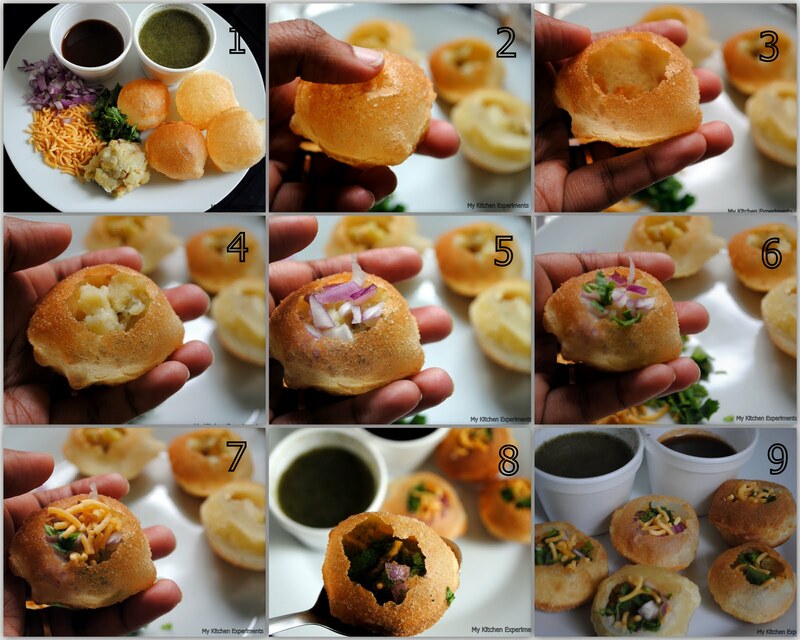 2) Take a fried puri and slightly press on the lighter side of puri to make a hole using your thumb. 3) Stuff the hole made in the puri with a small quantity of mashed potato, chopped onion, coriander leaves and sev (Indian snack). 4) Just dip this stuffed puri in the pani bowl or add 2 tablespoons of pani inside the puri and eat it immediately in a single bite. The taste should be yumyyyyyyy! 5) Repeat this step for other puries. Have a delicious evening!